Partly to mostly cloudy. A stray shower or thunderstorm is possible. Low 57F. Winds light and variable. Ding Yang tests the blood of Rena Banks. 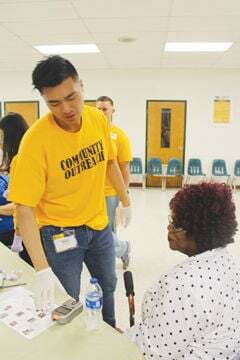 RAM (Remote Area Medical Clinic), a nonprofit organization that provides medical, dental and vision clinics in high poverty areas will host its third event in Emporia on June 21-23. But to host such a huge clinic RAM needs volunteers, vendors and donations of any amount. “We have 35 medical professionals, two dentists, and 61 other volunteers registered to help,” said Elise Brown, Volunteer Coordinator. By not receiving government funds, RAM is able to help everyone with a need. They don’t receive any financial help from state and federal governments. Last year almost 800 people received services. About 775 volunteers helped provide more than 3,900 services in one weekend. Along with medical, dental, and vision services, RAM provide EpiPens, knew braces, hearing aids, dentures, dermatology, podiatry, diabetic consultation, A1C testing, immunizations, CPR training, poised training, cardiology, 140 VSP eyeglass vouchers and more. They even provided appointments for pets to be spayed and neutered at no cost. Patients are selected on a first-come, first serve basis, and are not charged for the services they receive. If you would like to volunteer to to www.ramusa.org/volunteer. “Together, we can help the generous medical community deliver competent and compassionate health care to those who are impoverished, isolated, and under-served,” said Brown. Local resource information is needed. Patients have time between their appointments with whatever service they are seeking and have free time on their hands to pick up informational booklets about diseases, local resources, etc., or even attend a Narcan class. For more information email Brown at: elise@enroll-virginia.com or call (434) 336-7757.